Panago Pizza has added a gluten free crust to its menu. It should be rolled out now or rolling out soon, and I hope to be trying it soon and sharing more about the pizza itself shortly. In the meantime, I wanted to share with you some of the facts I dug up while researching their crust. They currently indicate the gluten free crust on their downloadable menu. Check out Panago's menu here. I had contacted Panago a few years back about adding a gluten free crust to their menu. Their response was that they did not want to add a crust until they found a crust that met their quality of standard. Well, I guess they finally found the right gluten free crust. So that is fantastic that there is a chain pizza delivery place thats not Boston Pizza in Edmonton that serves up gluten free pizza crusts. Okay, so now for some info Panago shared with me through private Facebook messages. First, they are obviously covering their buts on the gluten free crust and cross contamination as they probably have too since they work in a kitchen that is not strictly gluten free. Their crust comes from a gluten free facility (they didn't tell me if its their own crust or someone elses crust) so they are confident that the crust is gluten free, but (here is their disclaimer), they do not recommend the crust for Celiac's, because of the working conditions of the kitchen. Fair enough, I don't think that's going to stop Amanda from eating their gluten free pizza. Each store will be equipped with 2 gluten free specific screens for cooking which will be stored in sealed plastic containers between uses. Which is two great practices. Just remember when ordering to remind them! I certainly look forward to trying this out. Hi Abisaac - we would love to hear your feedback on our Gluten-Free crust once you have tried it. I am so excited to try their pizza! I've never had real "takeout" pizza! Our new Panago Gluten Free crust will be available in stores in the next few weeks, if you like I will add your Email address to our list and will send you an Email as soon as the Gluten Free crust is available to order from your local Panago. Thank you, yes, please add us to your distribution list when the gluten free crust is available in Edmonton. info@glutenfreeedmonton.com. "Our Gluten Free crust will be available in our medium 14 inch pizza. The Gluten Free crust is a pre-made product we get from a Gluten Free supplier." I had gluten free pizza from Panago tonight! The call centre that takes orders was very good about checking ingredients for me. I have missed their chicken taco pizza so much, it was a great treat! Does anyone know if this is just is all Panago's? Has anyone felt sick from the panago gf pizza? I ate Panago pizza last night and ordered the gluten free Philly Cheese Steak. I am a celiac and definitely reacted to it. I usually get a bit sick if I eat Boston Pizza, but this was a full on gluten attack. I thought I would give it a try since it seemed like such a treat, however, I would definitely follow their warnings and if you are celiac or sensitive I would not eat there. Hopefully in the future they will change their process's so us Celiac's can eat there without getting sick. 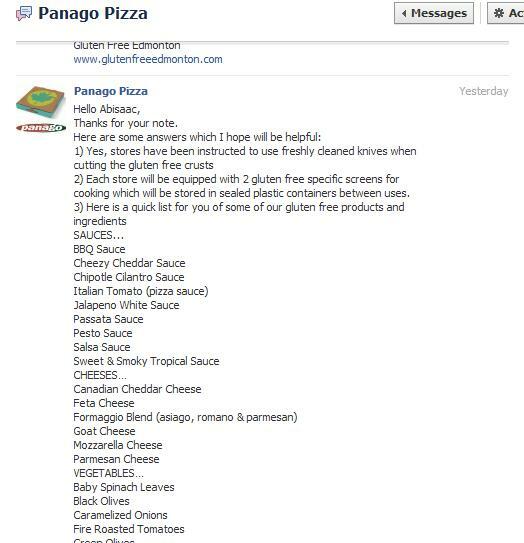 FALSE ADVERTIZING: THIS IS WHAT PANAGO SAYS: IT SHOULD SAY 'GLUTEN REDUCED"
On a visit to Alberta my wife who is Celiac had a gluten free panago pizza and had a very bad gluten attack so would be very suspect as to the Gluten free claim. It says right on their menu this.. *The nature of our operations and open-concept kitchens present inevitable flour cross-contamination and therefore gluten exposure. This crust is NOT recommended for celiac disease sufferers or those customers with a moderate to high gluten intolerance or sensitivity. I have had the tropical hawaiian panago pizza with the gluten free crust and it was awesome! I have celiac disease and have not had a problem with eating this pizza. I am excited that there is take out pizza available! This is by far our favorite gluten free option from a restaurant. We have tried multiple other places, and this is the best yet. Boston pizza only uses Kinnikinnick crusts, so it's a bit of a rip off considering you can buy a box of those crusts for what they charge for one! If you get panago, it has a thinner, crunchier crust! (For those of you missing thin crust, this is it!) I have a medium-high gluten sensitivity, but I haven't had a problem with this pizza yet.